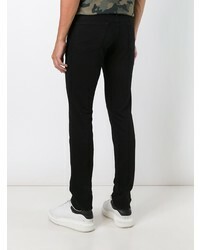 Consider wearing a navy print crew-neck sweater and Frame Denim long skinny jeans from farfetch.com for a comfy-casual look. Up the cool of your look by rounding it off with black leather derby shoes. 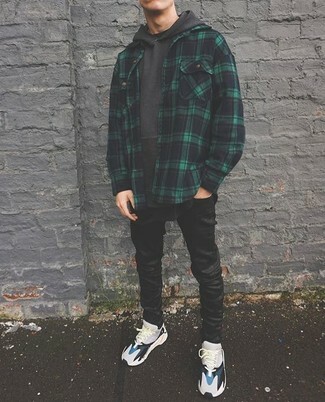 If you're on the lookout for a casual yet dapper outfit, wear a dark green plaid shirt jacket with Frame Denim long skinny jeans. Both garments are totally comfortable and will look great paired together. 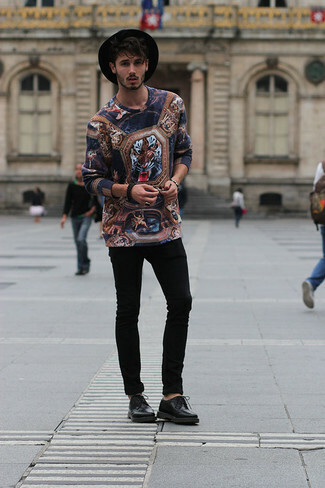 For something more on the daring side to complement this outfit, throw in a pair of grey athletic shoes. 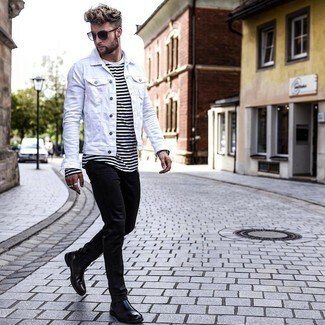 We all getup for comfort when it comes to dressing up, and this combination of a black leather biker jacket and Frame Denim long skinny jeans is a great example of that. Sporting a pair of black leather casual boots is a simple way to add some flair to your getup. 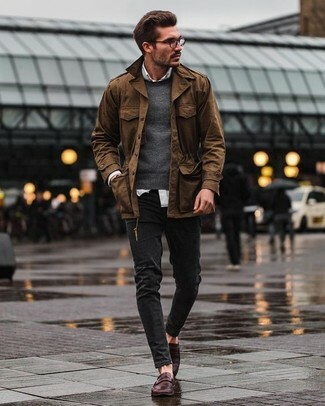 This pairing of a brown barn jacket and black skinny jeans exudes comfort and functionality and allows you to keep it clean yet trendy. You could perhaps get a little creative in the footwear department and spruce up your outfit with dark brown leather loafers. 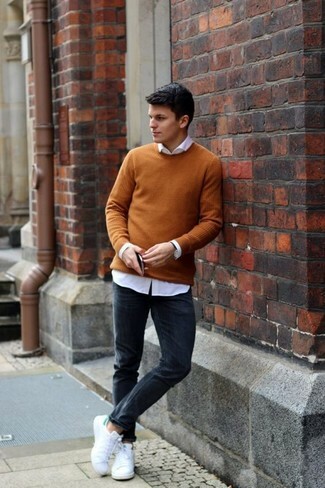 If you're scouting for a casual yet dapper getup, wear a mustard crew-neck sweater with black skinny jeans. Both garments are totally comfortable and will look great together. 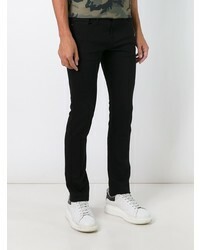 When it comes to footwear, this outfit is complemented well with white canvas low top sneakers. 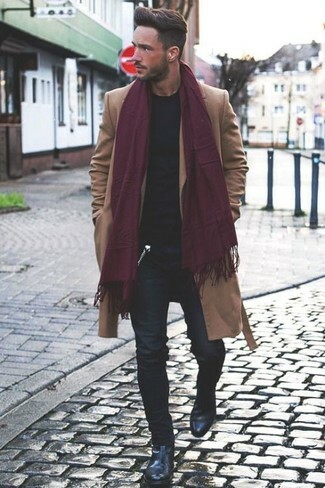 If you're on a mission for a casual yet dapper getup, try teaming a camel overcoat with Frame Denim long skinny jeans. Both items are totally comfortable and will look great paired together. 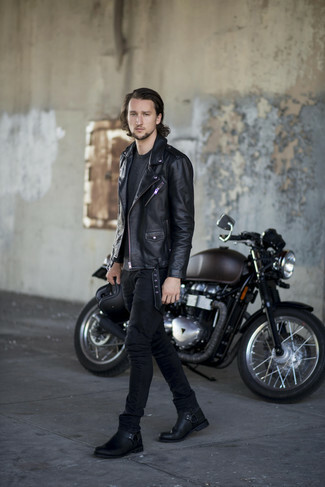 Amp up the cool of your ensemble by completing it with black leather chelsea boots. If you're on the hunt for a casual yet sharp getup, pair a white denim jacket with Frame Denim long skinny jeans. Both garments are totally comfortable and will look great together. Dress up your look with black leather chelsea boots. If you're on the hunt for a casual yet on-trend outfit, consider pairing a black fur coat with Frame Denim long skinny jeans. Both garments are totally comfortable and will look great paired together. Sporting a pair of dark brown leather derby shoes is an easy way to add extra flair to your ensemble. 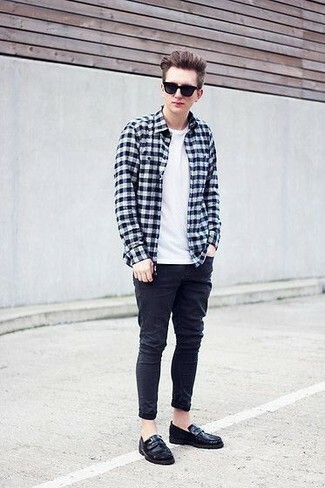 Pair a black and white gingham long sleeve shirt with Frame Denim long skinny jeans for a relaxed take on day-to-day wear. Spruce up your outfit with black leather loafers.